The beautiful Beachcomber Inn property is situated on 200 feet of Lake Tahoe’s south shore. We have a variety of options for a great and comfortable stay in Lake Tahoe. Some units have fireplaces. ALL units have stunning lake views. 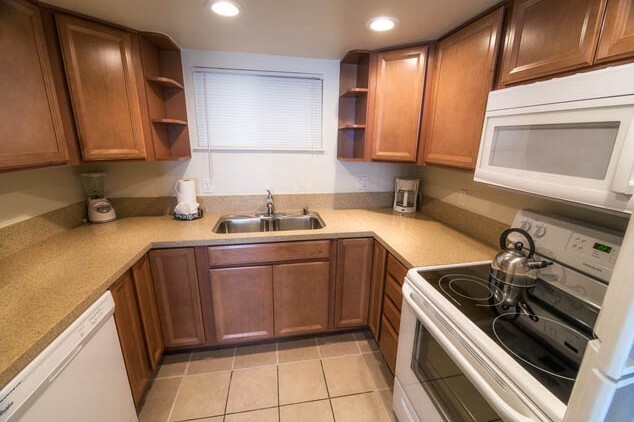 Nearly all units have full kitchens. Lake view, fireplace, balcony overlooks pool, one queen Murphy bed (wall bed), one queen sofa airbed, convenience kitchen, and one bathroom. These units are Beach level units with one queen bed, one queen sofa airbed, a full kitchen and lakefront patio. Lake view, one queen bed, one queen sofa airbed, full kitchen, balcony, and a fireplace. Lake view overlooking pool, two queen beds, one queen sofa airbed, full kitchen, and balcony. Street level, lake view, two double beds, one double sofa airbed, small kitchen, sliding glass doors in bedroom and living room, and large patio. Unit L is ADA approved handicap accessible. Second story units, lake view, two queen beds, one queen sofa airbed, sliding glass doors in bedroom and in living room, full kitchen. Large Balcony. Two bedroom unit sleeps 6 with king bed in one bedroom and two queen beds in the second bedroom. One bathroom with steam shower, living room and fully equipped kitchen. Large Balcony. This 279 sq. ft. Hotel Unit, has 1 Queen Bed, 1 Bathroom, Mini-fridge and Microwave. Although it does not have a Lake View, it does share all of the amenities of the property including, seasonal outdoor pool and hot tub, year round indoor hot tub and workout room, 200 feet of beach, BBQ’s and Recreation Room. Call the resort directly for booking information.